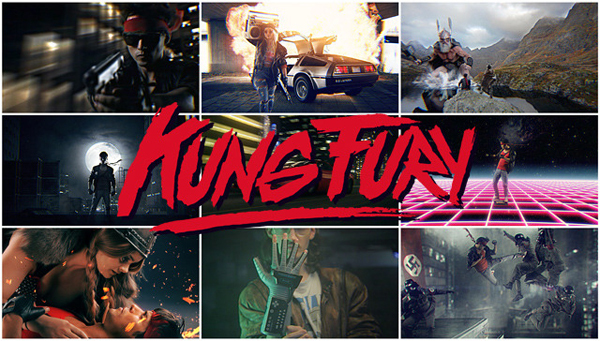 80’s inspired short film Kung Fury hits Kickstarter and goes viral. Kung Fury is the project of David Sandberg an 80’s inspired action comedy featuring vikings, fast cars, dinosaurs, time travel and a cop on the edge who likes to break the rules. The project launched on Kickstarter and the trailer quickly went viral, even getting coverage in The Independents Arts section, as a result Kung Fury has already smashed its initial target in mere hours with 27 days to go. Inspired by a love of 80’s films ‘Kung Fury’ has been shot primarily on green screen to save money. Sandberg who previously worked on adverts and music videos invested his own money on the project and shot it in his own time with help of friends. The budget was so limited he could only afford one police officer costume, requiring several extras to be shot seperately and composited together for background shots. Most of the footage is already shot, Sandberg needs the funds to hire extra help for the extensive and time consuming visual effects which he worked on himself for the trailer.